Plot Pro 40 Gallon UTV Spraying system comes with a 40 gallon poly tank, 1.8 GPM pump, 15' boomless spray tip and a hand wand nozzle with 6 Ft of spray hose. 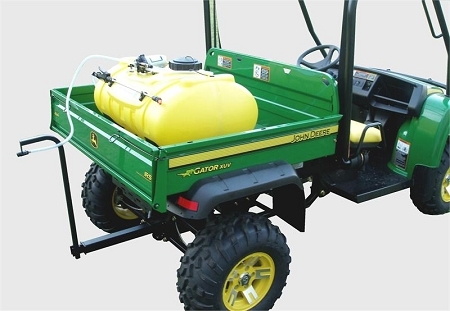 This sprayer is designed to work with utility vehicles with a 2" rear receiver hitch. The Plot Pro Spraying System is a revolutionary solution to small-scale spraying. The Plot Pro Sprayer is ideal for around the farm, home or hunting lease. The Plot Pro sprayers come with 15, 25, 40 or 50 gallon tanks and are designed to conveniently strap to ATV rear racks or utility vehicles without the need of special hardware or wrenches. The Plot Pro Sprayer also includes our boomless tip assembly that delivers a 15 ft. spray swath for perfect coverage when managing food plots, orchards, lawns, etc. - eliminating the need for awkward booms that are difficult to maneuver in close areas. A hand-wand spray nozzle with 6 feet of hose, a splash-proof vented lid, a toggle cut-off switch, a large 15 fill well and a drain valve come standard on all models. The Plot Pro hand-wand can be set to deliver a fine mist for delicate, controlled applications or adjusted to reach out to 25 ft.